A piquant sweet-and-spicy sauce glazes these baby-back ribs and makes them sticky good. You need to peel off the membrane from the ribs, then cook them about 2½ hours, which you can do in advance. Before serving, give them a quick turn under the broiler and bring them out sizzling hot with plenty of napkins during Super Bowl halftime. 1. In a large saucepan over medium heat, heat the oil. Add the onion and cook, stirring often, for 10 minutes or until softened. Add the garlic and ginger and cook, stirring, for 2 minutes. Add the hoisin and soy sauce, vinegar, honey, and red pepper. Bring to a boil. 2. Lower the heat and simmer for 5 minutes. Remove ½ cup of the sauce for brushing on after cooking the ribs. 1. Set the oven at 300 degrees. Line a large rimmed baking sheet with foil. 2. Remove the tough membrane on the bony side of the rib by setting the racks, meaty side down, on a cutting board. Cut a few long slits across the bones into the membrane. Using a paper towel in your hand, grab an edge of the membrane and pull it off. Remove as much as possible. Sprinkle the racks with salt and pepper. 3. Set the racks, bony sides up, in the pan. Cook for 1 hour. 4. 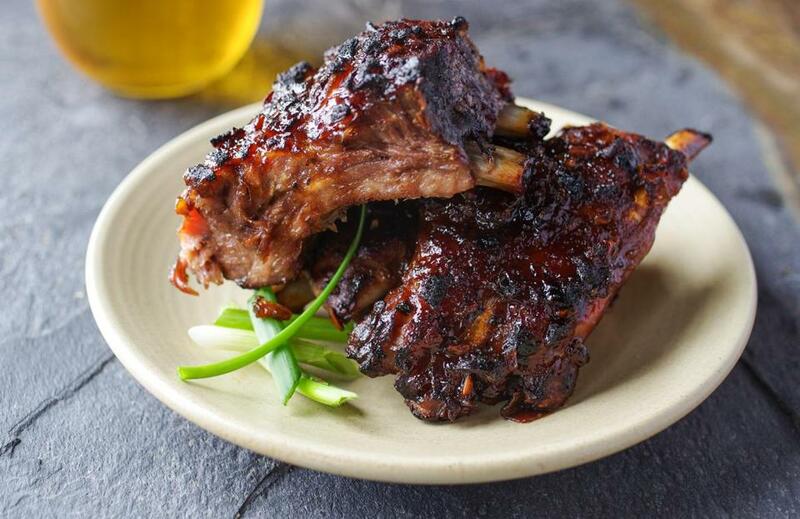 Brush the bony side of the ribs with sauce, then turn and brush the meaty sides. Leave meaty sides up. Cover the pan with 2 sheets of foil and crimp the edges to seal them. Cook 1 hour more. 7. Set an oven rack 5 to 6 inches below the broiler element; turn on the broiler.